In the bibliographical essay appended to his excellent book on the Supreme Court and American constitutional law, Mr. McCloskey, Professor of Government at Harvard, registers a well-mannered and well-taken complaint. The literature of his subject is enormous, he says, and it maintains “a noble tradition of precision and thoroughness.” But it exhibits also “an abiding reluctance to generalize or to carry inquiry beyond the borders of the technical legal issue into the realms of philosophy or interpretive history.” And so the laymen is made to think that constitutional law is “either impossibly recondite or impossibly dull, and probably both.” It is neither, and Mr. McCloskey proves it. We have, naturally, had other books, both by political scientists and lawyers, that have carried the inquiry beyond the borders of the technical legal issue. But some of these have carried it way, way beyond, losing sight of the actual Court and its actual work. Some have covered only segments of the subject. And some, though without taking total leave of legal issues, have concentrated hard on the advocacy of this or that thesis, so that in the end they were more provocative than satisfying. Mr. McCloskey’s book is a rare achievement because it is none of these. It is lucid, readable, indeed, brilliantly written, and—meaning no disrespect—sound. It is not tendentious. It rests on what the great majority of modern students of the subject would consider common ground. And yet it makes an original contribution in its sweeping presentation of 170 years of history. Early in its life, as Mr. McCloskey tells us, the Court saw it as its peculiar function to take the long view where others take the short. And that is precisely what McCloskey himself does. He remarks but four or five periods in the Court’s history. Staking out a claim to the power of judicial review in the first dozen years is followed by establishment of a limited but secure sphere of judicial supremacy. The institution is dedicated to the service of nationalism as a dominant value and of the rights of property as a congruent value. From 1835 to the Civil War, the Court consolidates, trims and maneuvers, but carries its mission forward. Under grave provocation and gripped in “the pride of power,” the Court commits the Dred Scott case, and that, as Fouché might have said, “is more than a crime; it is a blunder.” But the Court survives that, as well as the war (which like all wars is very hard on judges), and launches itself upon a task of qualified but nonetheless vigorous protection of the business community against government. The dominant value now is laissez-faire. In a number of spectacular cases in the twenties and thirties, five Justices seem quite “deluded by the notion that the welfare state could be judicially throttled and the brave old world of their youth restored.” The consequence is almost the end of the story, but the Court, lying down to bleed awhile, rises to fight again. The dominant value in the modern period is civil rights. All this sounds plain enough, even obvious. In the form of such a precis as I have given, it happens also to be untrue. To make it true, as Mr. McCloskey does, takes a great deal of penetration of the judicial process and of American history, and a great deal of fleshing out. 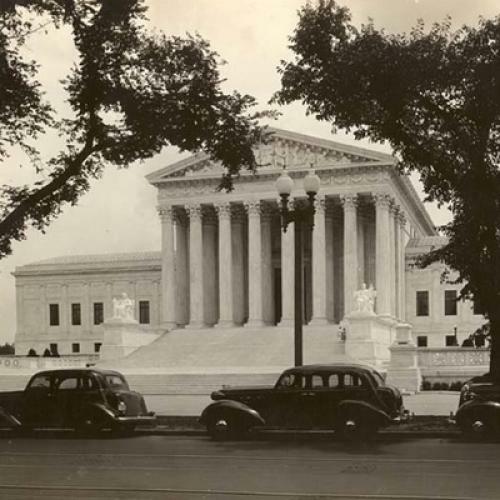 Then is the Court truly revealed as having “seldom strayed very far from the mainstreams of American life and seldom overestimated its own power resources.” For the Court’s behavior is conditioned by the tension between the twin American ideals (largely inconsistent) of popular sovereignty and fundamental law. Mr. McCloskey’s story stands safely on its own two feet. It is not a half-truth. But as he would concede, it is also not the whole truth. For the Court has its being in yet another state of inescapable tension, the tension in constitutional law (as in all law) between general principles and doctrine on the one hand and, on the other, case-by-case pragmatic development, the famed process of inclusion and exclusion. Holmes, the master of the common law, believed that “the chief end of man is to form general propositions – adding that no general proposition is worth a damn.” They are delusive when slogans are mistaken for them, and dangerous when they harden into dogma; yet the Court’s capacity to form and apply general propositions remains its chief end and reason for existence. Mr. McCloskey does not deny the Holmesian tension. The Court’s task, he warns, “requires judges who can practice the arts of discrimination without losing the light of reason and getting lost in a welter of ad hoc, pragmatic judgments.” But for his purposes he necessarily emphasizes the pragmatic process of inclusion and exclusion, imposing on it a historian’s order. That the examination and evaluation of doctrine, of its coherence and of its validity, is an equally important undertaking, and that it can be equally illuminating in going “beyond the borders of the technical legal issue” is demonstrated by Miss Thomas’ book on Justice Frankfurter. In terms that make her volume accessible to the general reader. Miss Thomas, a member of the Department of Political Science at Goucher College, analyzes the career and the work of Justice Frankfurter. Regarding that career as a whole, and not forgetting a Holmes or a Brandeis among his elders, or a Black among his contemporaries, it is not too much to say that Justice Frankfurter has been for a generation the single most influential figure in American constitutional law. Miss Thomas has produced, therefore, a history of the modern Court. And it is a good one. She writes in depth and in detail, with perception, and with insight which is often, as in the chapters on Symbols and on Group Conflicts, quite remarkable. She is detached, she is judicious, and she is critical. Her book is not a recital but an evaluation. Miss Thomas’ vantage point is, as I have suggested, different from Mr. McCloskey’s. She seeks to identify and assess the unifying principles that inform the vast number of opinions she passes in review. Since she writes of law, and more particularly of a disciple of Holmes, she finds, of course, that among these principles is the one which reads: “No general proposition is worth a damn.” Yet it is the judge’s calling to give us principles that transcend the moment’s pressing concern, and himself to serve them faithfully. His fidelity to principle—and to which principle—is one of our standards for judging him. Miss Thomas’ book is a significant addition to a literature which, as Mr. McCloskey gently implies, while it is enormous, is not necessarily rich.